Happy Tuesday, everyone!!! This was one of my favorite outfits I wore last week (you might’ve seen it in this Instagram post). I’m obsessed with these jeans (I literally wear them like three days a week!!) 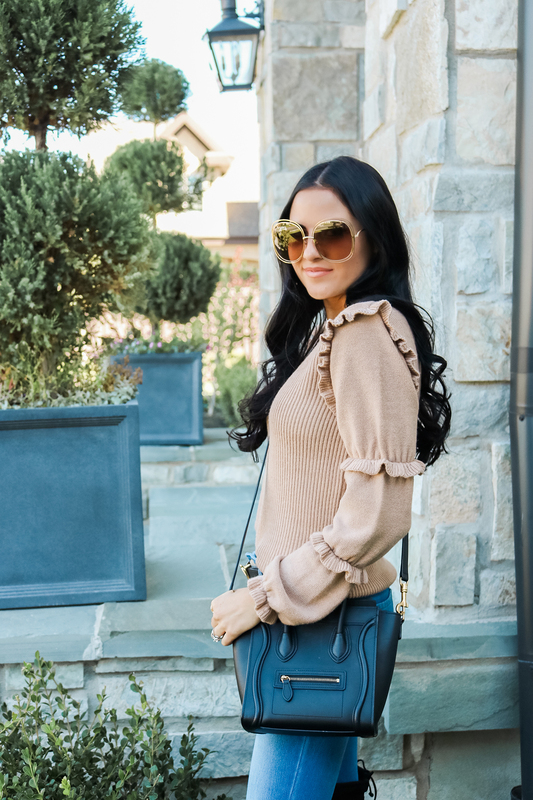 and I love the ruffle detail on this neutral sweater! Don’t forget tomorrow will be my Inspiration Wednesday post along with a Q&A! Every Wednesday I’ll be answering your questions, so leave them in the comments below and I just might choose your’s! Rockstar jeans are the best. So dang comfortable, such a good price, and they come in tall sizes which I need. Love love love them. Seriously!!!! They are the best! Thank you Soraya! I love over the knee boots!!!! That ruffle sweater I SO cute! 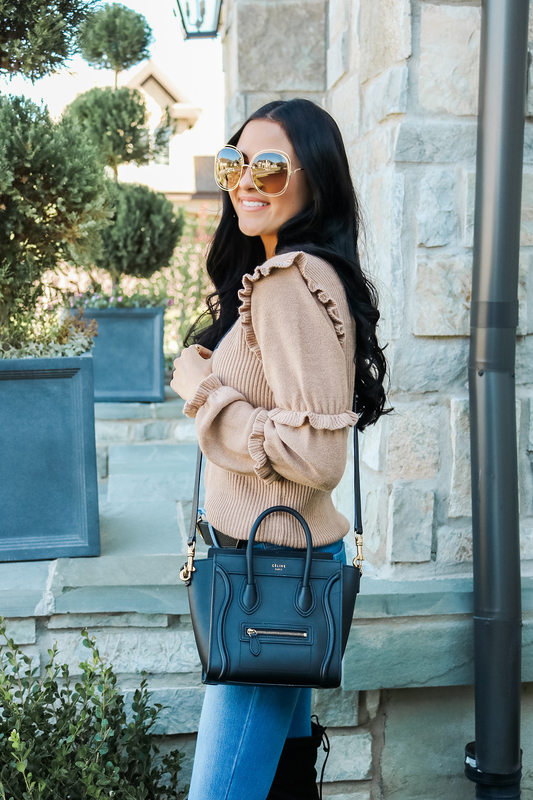 what a fun piece for fall. This is so pRetty Rach! Love your top. You are so cute! Great outfit! I’m Always looking for outfits that are both stylish and comfortable and this looks like A great combination. I also LIke How you combine high and low. I will have to check out these jeans! You definitely need to check out these jeans!!! You will love them :) Thanks for stopping by! Those jeans are CUTE! I can’t believe their old navy! Love this sweater and outfit! Club monaco is one of my all time favorite brands. hey i would love to see you add your “wednesday inspiration” posts somewhere in your drop downs :) I really get inspiration (haha hence a good post name for them) from it! Keep up the good work lovely lady. rACHEL I LOVE THIS LOOK! NEUTRALS ARE THE WAY TO GO FOR SURE! I’m so obsessed with those sunglasses! The shape is so unique! How do you deal with “haters”? – The crItics. Have you ever been in a social SItuation wHere someone publically says something nehatively to you? How do you deal wIth it in that SETTING? those jeans are only $32?!! I got to get my hands on them! i love this whole look babe!